Oxford: np, 1963. First edition. Fine. REMARKABLY REVEALING LETTERS BY TOLKIEN PROVIDING INSIGHT INTO HIS THOUGHTS AND MOTIVATIONS IN THE CREATION OF THE LORD OF THE RINGS. The first letter - a typed letter signed on Tolkien's Oxford stationery - is dated 16th December 1963 and is a response to a letter from Baronne Baeyens of Bonn, German. 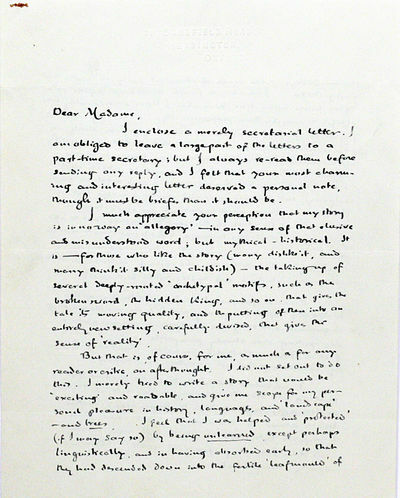 In this short letter, Tolkien expresses thanks for her letter, rejects allegorical interpretations of The Lord of the Rings, and admits feeling sympathy for Gollum. It reads in full: Dear Baronne Baeyens, Thank you very much for your letter of 28th September. I am sorry to have been so long in answering it, but I am very busy and not in good health. [signed]JRR Tolkien Something, however, struck Tolkien about Baeyens letter and upon reflection, it spurred him to write much more. In this long (four full sides), handwritten letter, Tolkien addresses some of the most critical topics associated with his writing. Over the course of the letter he: -insists that The Lord of the Rings is "in no way an 'allegory'", but "mythical-historical" based on "deeply rooted 'archetypal' motifs"
-reveals his motivations for writing The Lord of the Rings ("I merely tried to write a story that would be 'exciting' and readable, and give me a scope for my personal pleasure in history, languages, and 'landscape'") -bemoans certain analyses of The Lord of the Rings that focus on symbolism ("they miss the point and destroy the object of their enquiry as surely as a vivisectionist destroys a cat or rabbit") -addresses religious "alignment" of The Lord of the Rings -notes that he plans to produce another book about the same world -explains the purpose and nature of the verses in The Lord of the Rings -admits finding "very moving... the place where Gollum [is] on the brink of repentance" -and in perhaps the most interesting section, in a detailed explanation of the origin of the character Stryder/Aragorn he provides wonderful insights into his method of creating characters. The letter reads in full: Dear Madame, I enclose a merely secretarial letter. I am obliged to leave a large part of the letters to a part-time secretary; but I always re-read them before sending any reply, and I felt that your most charming and interesting letter deserved a personal note, though it must be briefer than it should be. I much appreciate your perception that my story is in no way an 'allegory'-in any sense of that elusive and misunderstood word; but mythical-historical. It is-for those who like the story (many dislike it, and many think it silly and childish)-the taking up of several deeply-rooted 'archetypal' motifs, such as the broken sword, the hidden King, and so on, that gives the tale its moving quality, and the putting of them into an entirely new setting, carefully devised, that gives the sense of 'reality.' But that is, of course, for me, as much as for any reader or critic, an afterthought. I did not set out to do this. I merely tried to write a story that would be 'exciting' and readable, and give me a scope for my personal pleasure in history, languages, and 'landscape'-and trees. I feel that I was helped and 'protected' (if I may say so) by being unlearned except perhaps linguistically, and in having absorbed early, so that they had descended down into the fertile 'leafmould' of the mind beyond the reach of chemical analysis, myths and fairy-stories. I have never found books on myths and symbolisms attractive, even when I have occasionally been obliged to consider them professionally. For me they miss the point and destroy the object of their enquiry as surely as a vivisectionist destroys a cat or rabbit-whatever validity and usefulness the result may have on their own plane. I have been treated to analyses of my tale which affect me as much as would, after enjoying a good meal in good company, not perhaps a cook's practical recipe, but a chemical analysis of the ingredients and physiological descriptions of the action of the digestive organs: not to add pulling the cook also to pieces to find out how he worked. Alas! there are so many people who cannot 'enjoy' anything. And still more who cannot distinguish between allegorical intention, and 'applicability' (by the reader). It would, of course, have been destructive of the 'historicity' of an imaginary period in the remote past, if alignment with religions or religious organizations now existing were clearly perceptible. But I am in fact a Roman Catholic-not by inheritance from my German protestant ancestors in Saxony. May I say that I am greatly pleased by your liking for my verses. They are seldom mentioned by readers or critics (and if referred to are usually discussed with a shrug or a grimace). Few people at present seem able to see any virtue in verse that is not subjective, and if possible filled with a grievance. I think it escapes most readers that the verses in the book have little or nothing to do with J. R. R. T. or his views of the world or of himself or even with his personal taste: they amused him, of course, as exercises in different styles and metres, but in intent they are 'dramatic': the kind of things that the characters themselves might be supposed to write or to like. I was also interested in your remark on 'Stryder.' I do not (consciously) formulate characters. Whatever may really happen, this sensation is rather that of someone getting to know strangers and observing, often with surprise and sometimes with alarm, their revelations of themselves-which one is helpless to alter. In writing so long and interwoven a story one's main conscious concern is technical: keeping the story going (more or less in crescendo) and the separate threads coordinated. The characters arise largely out of the necessities of narrative: they seem to walk on unheralded in any 'dramatic personae' or bill of performance: Maggot, Bombadil, Boromir, Faramir, Denethor, Galadriel, Theoden, Eowyn, Saruman, etc. The origin of Aragorn was a vivid picture, that arose early, of the inn-scene and a shrouded ambiguous figure sitting aloof. I knew no more about him than did the hobbits, and was alarmed (because of the work entailed) and astounded as slowly the revelation of the majesty of lineage, the greatness of his labours, and the weight of his doom unfolded. But looking back, I can see that his character, as seen in behaviour, in his tremendous circumstances, owes a great deal to people, and a man in particular that I have known. Of the 'perilous' kind, that I find in a way most attractive. I mean those interiorly large and powerful, in whatever bodily form they appear, and whatever veils of gentle manner they may (as a rule) wear. They often surprise you, because sharp facets of word or deed may suddenly show that only long knowledge could relate to their centre. They cannot be taken for granted. If you become slack, after (say) much experience of their kindness, and treat them as if they were something soft (like india rubber), you find that what is only insulation covering a live wire connected with a dynamo-and you get anything from a smart titillation to a severe shock. The man I think of would have spoken just in the way Aragorn did, in the House of Healing, to Merry (III 146). And (with more shock) as A. did to Gimli (III 53). Please give my best wishes to your son. He is of course right and perceptive to pity Gollum. I find still very moving to me the place where Gollum on the brink of repentance is cast back by the brusque and understandable ([???] very perceptive) loyalty of Sam. The drawing I am grateful for. It is more than 'amusing'. I have written quite a lot, after all. Specializing in First editions of highspots in Science, Literature, Art & Photobooks; Classics in all fields.